Marking the end of the two-week Spring Festival celebration, the Lantern Festival’s origins are rooted in Chinese mythology. Like many of the Chinese festivals, there are numerous legends. The most popular legend about the Lantern Festival’s beginnings can be traced to a homesick palace maid. One day, a young girl was crying by a well. A well-respected official of the court stopped and asked how he could help. The girl, Yuan Xiao, told him that she missed her family and hadn’t seen them since she had started working at the palace. The official was determined to help her and set up a fortune-telling booth in the centre of the city. People flocked to his stall and he told them all the same thing: a huge fire would ravage the town on the 15th day of the first lunar month. A red fairy would ride into town on a horse. Yuan Xiao dressed up as the red fairy and rode into town with a decree for the emperor announcing that the town would be set on fire on the appointed day. The Emperor, who asked the official for advice, was told to order his people to set firecrackers alight, hang lanterns outside their homes and prepare tangyuan, glutinous rice balls filled with peanut or sweet bean paste. in order to appease the red fairy. When she rode into town on the 15th day of the first lunar month, she was greeted by a cacophony of fireworks and red lanterns. 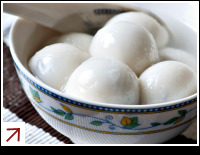 Since then people have celebrated the day by lighting lanterns and enjoying tangyuan. Processions of children carrying beautiful lanterns line the streets of most Chinese cities and towns on the day. When is the Lantern Festival in 2013, 2014, 2015, 2016, 2017?